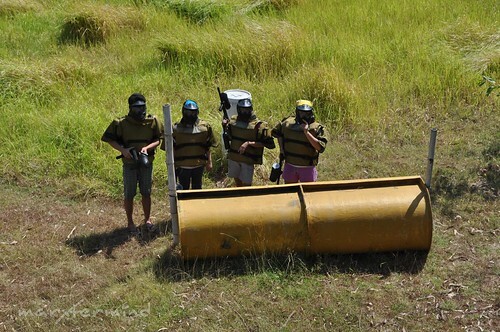 Aside from the activities I mentioned in my previous entry, Island Cove has another adventure to offer, Paintball. Paintball is a sport in which players compete, in teams or individually, to eliminate opponents by hitting them with capsules containing food coloring and gelatin (referred to as paintballs) propelled from a device called a paintball marker. Paintballs have a non-toxic, biodegradable, water soluble mineral-oil. Games are played on outdoor or indoor fields of varying sizes. Before the game had begun, the officer in charge discussed how to play the game and specified the variety of rules and variations. Shoot your opponent from afar only and definitely no headshot. There are protective gears provided so there’s no need to worry. 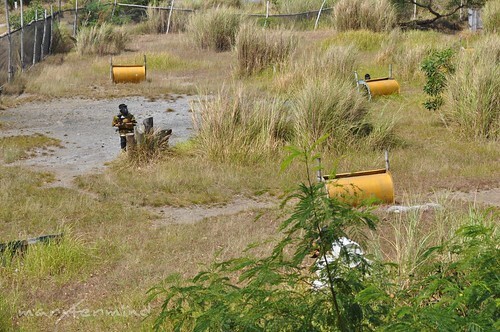 (Parang kagat lang daw ng langgam pag natamaan ka ng paintball). By the way, the game costs PHP 250.00 with 25 bullets. So if a player ranout of bullets, just lift up the rifle and exit the field. Since there are only 8 rifles available, we were grouped into two batches. I am part of the second batch, so while waiting for my turn we went to the viewing deck and watched how the 1st batch played. We heard one of our office mates screaming “Tama na, tama na!”. The opponents haven’t noticed that one of our office mates lifted the rifle and already ran out of bullets. 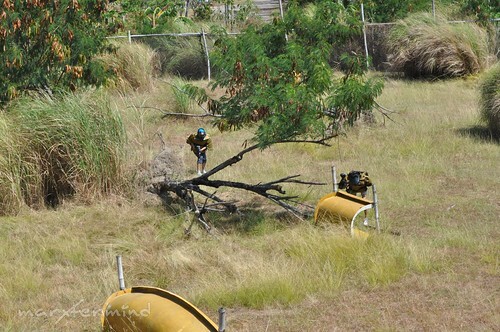 When she went out from the bushes, her head gear is full of paint, di na daw sya makakita sa puno ng paint ung gear! It was our turn to play, so let’s get it on! I felt nervous and excited at the same time. The sun was up, and it was very hot with the protective gear on. When we entered the field, I didn’t know where to place myself. We had no game plan at all. So kanya-kanya na toh! I didn’t know what will be my tactics but one thing in my mind was just shoot when there’s opponent in sight. I planned to transfer position and go near at the opponents place but I felt someone is shooting me from the back, and there he is! The enemy conquered our territory. A good plan for them indeed! 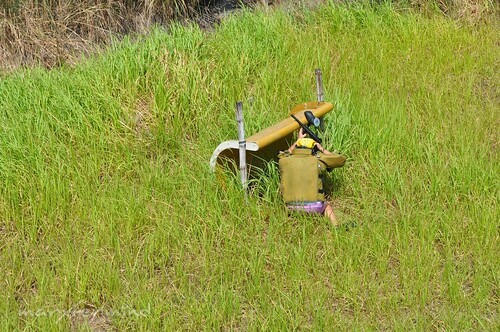 Hiding from the bushes is a good tactic, our protective gear is as color as the bushes so opponents will not notice us easily. So I just stayed in my position. Para akong nasa aksyon movie with gapang effects pa sa mga talahib! It was a fun game, though it was itchy afterwards. This is the game! 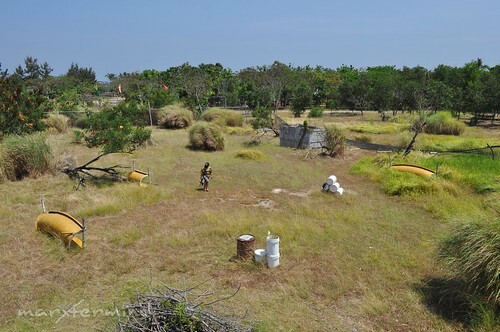 The set of the paintball field added up the excitement and thrill. I will definitely do paintball again, sooner or later! 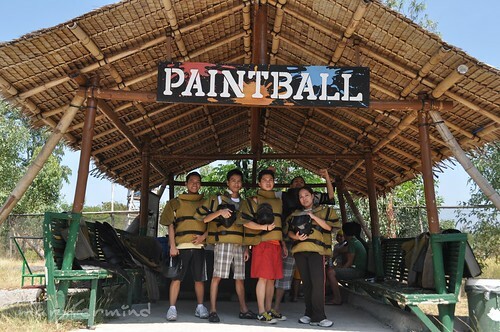 Thanks for sharing your paintball experience with us. I am also a game lover i love to watch action movies and playing online games. Paint ball is my favorite games all of them. @Kura, Talagang di ka na kaalis sa pwesto mo? Hahaha! Nakakatakot din kahit alam mong laro din, pero masaya sya… Gusto ko ung sa Antipolo, parang gubat kasi ung set up! Magkano sa Antipolo? wahaha! I don't want to do it again. Hahaha! I tried it once. Sa Gotcha Alpadi, Antipolo ata yun. Yun yung year-end activity namin sa dting office ko. sobrang kabado ako at ayokong lumabas sa lungga. hahah! Ayun, nilamok ako ng bongga. I beg to disagree, hindi siya kagat lang ng langgam. Yung officemate kong tinamaan sa binti, duguan. hahaha! Kaya natakot na ko. Pero it was fun. Feeling ko nasa Counter strike ako. Sigawan pa ng sigawan yung mga ka-team ko. Alam mo yung eksena sa pelikula.. nasa likod ng puno yung bida tapos may sinasabing dialogue. Ganun! hahaha!